Conjectural view of Tonbridge c1260 (J.F. Wadmore 1886). The Barbers time in Tonbridge began soon after the death of Thomas Barber in 1649. His widow Anne continued to live in Rotherfield for a while and remarried Samuel Theobald, a clothier, probably in the late 1650s. They appear to have moved to Tonbridge around 1662 when they leased the Rotherfield properties to their son Thomas. In 1670 Samuel is recorded as a yeoman of Tonbridge. In 1662 Anne's son Thomas was already living away from Rotherfield working in Frant as a servant of the Weller family. By the time of his marriage in 1672 he had also moved to Tonbridge and in 1677 he sold the family home (Bonnetts and Bachelands) in Rotherfield village. This was almost certainly following the death of his mother who had a life interest in the property. Apart from retaining the Drapers property the family had now cut their ties to Rotherfield with Thomas now a husbandman at Hilden (now called Hildenborough), a hamlet within the parish of Tonbridge and a few kilometres away from the town. Tonbridge would have been a small market town in the late 17th century. It had a Norman castle, built to protect the important river crossing over the Medway, which unfortunately was destroyed as a consequence of the Civil War only a few years before the Barbers arrived. According to Chalklin, the population of Tonbridge in the late 17th century is estimated to be about 600-800 people. The town was an important commercial centre for the area with a weekly market and from 1671 a monthly cattle market. The trades and crafts were mainly blacksmiths, butchers, shoemakers and tailors, with the cloth industry being very important to the town. The lack of any specialised or luxury trades indicated that they were on the whole restricted to supporting the necessities of life and typical of a small market town dependant for its livelihood on the local farmers. Tonbridge was on the main road from London to Hasting and Rye and as a result there was also business for carriers and innkeepers with about half a dozen inns in the town. One interesting fact is that it had one of only four theatres known outside London in the 17th century. A court case at Maidstone Assizes Court records the fatal wounding of a man at the "Tunbridge Playhouse" in 1610. Whereas Rotherfield had been under the control of a single manor, Tonbridge, the largest parish in Kent, was divided between four large manors and at least another three smaller ones. According to Chalklin, there were few controls exercised by these manors (unlike Rotherfield) and most existed merely as collectors of rents, heriots, fines and reliefs. These dues were not particularly onerous to copyhold and freehold landholders as most were fixed by custom and had become trifling amounts over time (e.g. widow Mary Barber paid 6d per year as quit rent on her Hildenborough property). There was bigger money for the manors in leasehold property however, as these could be adjusted to market rates when leases were renewed. The Barbers first settled 2.5 miles north of Tonbridge town in Hilden (now Hildenborough) and came under the smaller manor of Datchurst. Thomas Barber's burial in 1683 notes that he is "of Hilden" and in 1691 the Widow Barber is admitted to a copyhold property beholden to this manor. They later held property in Tonbridge town which came under the manor of Tonbridge. An indication of the weak organisation of the manors, and the trifling amounts of customary dues, is highlighted by the fact that in 1832 many people were summoned by the manor of Tonbridge to pay quit rent arrears. The long list of people summoned would indicate that the quit rents had simply not been collected, with Mary Barber being 45 years in arrears @ 2d per year! When the Normans built the castle at Tonbridge they established the Lowry of Tonbridge – a district surrounding the castle, possessed by it with certain privileges. Within the Lowry of Tonbridge were the boroughs of Hadlow, Tonbridge town, Hilden and South (now Southborough). Only the last three appertain to the ecclesiastical parish of Tonbridge. 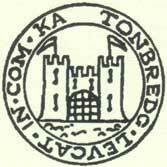 The Borough of Tonbridge town is the most important, containing the castle and the manor of Tonbridge. The owner was Lord of the Manors in the Lowry. The Borough of Hilden contains within it the manors of Hilden, Datchurst, Martin Abbey, Lamport, Nizells, Barden, Hadlow (not the same as the village of Hadlow), Hilden in Leigh and Penshurst Halymote, over all of which the Honor of Otford** also had jurisdiction (thus it was under the jurisdiction of two Lords which was not uncommon). If considering the ecclesiastical parish of Tonbridge then we are only interested in the manors of Datchurst (originally an appendage of the castle and manor of Tonbridge), and the manors of Hadlow, Nizells and Hilden. The Borough of South (i.e. Southborough) contained the manors of South, Barden and Hayesden, all of which held courts. The breakup of the large manors in the forty years after 1674 is of great importance to the history of Tonbridge as it changed the pattern of land ownership much to the benefit of the local people, especially the smaller gentry and larger farmers. Datchurst itself was divided into two parts in 1713. In 1741 the River Medway became navigable, turning Tonbridge into an inland port. Within a hundred years the population had quadrupled and the town transformed. ** The manor of Otford was originally held by the Archbishop of Canterbury but was transferred to the King under the reign of Henry VIII. It was thereafter known as the Honor of Otford with a high steward appointed to preside over it. At the time of Domesday the manor included lands held by 3 thanes (knights) and lands held by Richard de Tonbridge in his lowry. C.W. Chalklin, "A Seventeenth-Century Market Town: Tonbridge" Archaeologia Cantiana 76, 1961. Tonbridge Library: TU1/M1/23: Accounts of Quit Rents Due to Lord of Manor of Tonbridge (Collection of the solicitors Messrs. Walker, Templer and Thomson of Tonbridge). C.W. Chalklin, "The Rural Economy of a Kentish Wealden Parish 1650-1750" in "The Agricultural History Review", Vol X, 1962, Part 1. B. Wadmore, "Some Details in the History of the Parish of Tonbridge", 1906, (Tonbridge Library: C130314352). Drawing of Tonbridge Castle 1735.